This year, EA has decided to release FIFA 14 for Android at absolutely no cost. That's right -- you can download the FIFA 14 app for your Android tablet or phone from the Google Play Store for free. In the past, FIFA was one of the more costly apps you can buy. However, you'll find that EA still does monetize their mobile versions of FIFA with in-app purchases that you may be tempted to buy. This article is a tutorial and guide to the FIFA 14 Android app but if you're looking for more information, I'd highly suggest you check out the Supreme FIFA 14 Guide -- an expert FIFA strategy guide that will teach you how to dominate your opponent in FIFA and simply score more goals! When you first play a game, the app will automatically run you through a quick overview of controls. See the above image for instructions on the more basic controls in the game. To run, simply hold your finger on the screen in the direction you'd like to go. To pass, simply tap a teammate. To shoot, swipe in the direction you'd like to shoot. If you want to defend, it does get a lot more difficult. To try and tackle an opponent, tap on them when you are close. If you tap and then hold your touch, your player will run after the opponent and attempt to steal the ball. 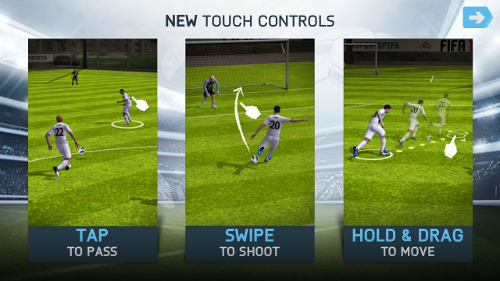 To slide tackle, simply swipe in the direction you'd like to slide tackle. FIFA 14 for Android features an Ultimate Team mode which is not too different from the Ultimate Team game mode most FIFA players have gotten used to with the Xbox or Playstation. In Ultimate Team, you will start off with a pack of players that will make up your first "Ultimate Team". The point of Ultimate Team is to win matches and trade your way to better teams and more coins. However, making a lot of coins can be very difficult. Some people resort to buying coins through in-app purchases, but that is not necessary if you learn how to trade. There are trading methods that can make you millions of coins - but those are kept as closely-guarded secrets. I would highly recommend you check out the FUT 14 Genius Guide to learn some of these methods so you won't have to worry about making enough coins for the teams you want to build. These methods were developed by a trading expert who used economics principles to come up with them. You will need to login with your EA Sports FC (EAS FC) account if you want to utilize all features of the app. In the app, EAS FC will allow you to view your overall FIFA stats, and sync your friends and other details of your EAS FC account with your FIFA 14 on any other console. You can also take part in a penalty shootout in the FIFA 14 Android app. You will be prompted to select the teams and a stadium. You can also select your kick taker lineup. To save penalties, simply swipe in the direction you want to dive as the kick taker approaches the ball. Shooting is also quite straightforward -- you just draw a line to where you would like the ball to go. Aim for the corners and you have quite a good chance of scoring. However, be careful as to not draw too large of a line or your player will miss! The key is to draw a line quickly and to a corner -- the quicker you draw the line, the harder the shot will be.